At Lacasse Fine Wood Products in Sudbury, Ontario we manufacture wood railings in a variety of styles and woods to fit all your home renovation needs. We have manufactured handrails in oak, maple, walnut and even American Black Cherry and it's more exotic cousin, Brazilian Cherry. Options that the big companies won't even consider. These wood railings are designed to compliment the new array of exotic woods available in hardwood flooring today, to allow you to decorate with complete freedom, knowing that you can find all the bits and pieces you need to achieve that "awe" factor in your decorating. For those that would like to consider introducing some metal or wrought iron into the mix, we carry in stock a number of styles of metal railing components and have many more styles that can be special ordered. Our metal spindles come in various colours, NOT just the basic black, to better compliment the richness of various types of wood. Textured black spindles look great with Brazilian Cherry but metal spindles powder coated rich dark brown tones look much classier with the mocha and chocolate based stains, common in the hardwood flooring pallet of colours these days. Let us mix and match finding the right solution for your home. The largest part of our traditional wood railing inventory is in Maple, Oak and Pine as sizing and installation regulations are clearly defined under the Ontario Building Code for these species. We also carry a pre-painted hardwood spindle for those individuals that would like to install a wood railing with painted spindles and want the "painting" already done.. this saves money AND effort. These hardwood spindles have been professionally coated in a spray booth, to give a quality finish to the end product, and with much less effort. 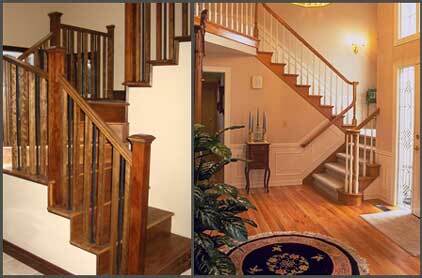 Quite popular today is a box style newel and matching square spindles. With in-house manufacturing capabilities it is possible to make this profile in an unlimited selection of wood species. You just need to ask. This style is also quite often mixed with wrought iron railings so check out our section below if that is a consideration. Metal spindles come in a variety of design options, but typically the first question one needs to answer is whether you would like "square" metal spindles or a "round" ones. You might not care as much as your installer. We are very cautious in selling ONLY product that complies with the Ontario Building Code Interior Railing Regulations... and we do provide engineering testing for all of our metal spindles directly to building controls for all clients building a new house. We have a number of railings installed in our showroom to give you a great idea on what the final product will look like, so please visit or our showroom or email with your requests. We have shipped both metal and wood components across North America ... our only limitation is we can not ship single handrail lengths via UPS .. they don't really like to deal with anything over 6' .. but wood and metal spindles, newel posts and steps are no problem.